The Twin Cities German Immersion School first opened in 2005. It was then and remains now the only German-language charter school in Minnesota and one of only a few nationwide. By the time the school's inaugural class got to 5th grade, the student population at TCGIS was 191 students and rising. We have moved twice already in our short history, and find ourself once again needing more room. We don't plan to grow forever and want to make this next enlargement our last. The view from the SE corner of the school's property highlights the cafeteria glazing and increased play area. The increased daylight in the new cafeteria will be a welcome upgrade from current conditions. The materials are precast concrete panels with red brick inlay, while the metal panels above are the same color and pattern as the 2013 addition. The glazed blue brick between the cafeteria and the 2013 addition is intended to be a backdrop for an art installation. It could showcase work from either known public artists or from TCGIS students. The addition will complement the original school building in height, massing and material selection. The South view from Oxford St establishes a new and more inviting Como Ave facade. Two more areas are reserved for public art installations - these could showcase historical markers, art from the community at large, or art from TCGIS students. The glazing at grade level will let natural light into the new gym, which starts 8' below grade. This is a look back at the conversation about the need for more classroom space at TCGIS. If you’d like to know what paths lay ahead for the school, skip ahead to the “Options” section of the website. Under the category of long-range planning, the board studied the possibility of adding a second campus. That idea was eventually deemed unworkable. In 2015, as more middle school students stayed and the school’s student population grew, the board appointed a task force on Oct. 22 to “research and assess the demand for current facilities and analyze data to consider demand on current facilities.” This was the Student Growth and Access Taskforce, and its members included TCGIS staff, TCGIS parents and one prospective parent. In February 2016, the Facilities Committee released a report on the coming space crunch at TCGIS. The report said that by the 2017-18 school year, the school’s population would exceed the school’s original design. To accommodate the students, a new room would need to be converted into a classroom each year: first the science classroom, then the computer lab, then flex room 100, followed by flex room 102, and finally, in the 2020-21 school year, the staff lounge. The report also looked at the school’s budget and determined that TCGIS could afford to finance an 18,000 sq. ft. project in the 2019-20 time frame. At the February, 2017 board meeting, the facilities committee update included a basic discussion of what’s needed, including a “Wish List” item of replacing the inefficient building with something new. The list was needed to send to Deb Rathman, the architect. The Facilities Committee continued to look at the school’s space needs at its March 2017 meeting (1) (2), noting at the time that $1.8 million plus the cost of the property would buy the school the classroom and staff spaces it needs, but not the extra gymnasium or cafeteria space. In April of 2017, the Student Growth and Access Taskforce delivered its final report, a mixed accomplishment that included hard data on some aspects of the issue, but was accompanied by a note from the task force expressing frustration at the process it took part in. The basic shape of the proposed building plan was taking shape at the April, 2017 meeting (1) (2), when real estate developer Karl Jentoft of the Tensquare Group said a bond issue for $4.8 million was possible. Architect Deb Rathman, who was responsible for TCGIS’s first addition at 1031 Como Ave., said that amount of bonding would fund about 21,000 sq. ft. of construction. At the June 13, 2017, facilities committee meeting, the committee was still preparing itself to buy properties adjacent to 1031 Como Avenue. At the Aug. 30, 2017, board meeting, there was no discussion of the facilities committee or the search for a new building. The September 26, 2017, board packet included basic sketches of several options for more space (option 3 and sketch) (option 7 and sketch) (option 8 and sketch) (option 9 and sketch) (option 10 and sketch), all plans showing TCGIS building on its current footprint. Plans to include Mission Orthodox Presbyterian Church, 1040 Como Ave., came to an end because the church was not willing to sell. The Church of St. Bernard’s option was not pursued because a) it was only available for lease; and b) it was not big enough to house the entire school; so c) the cost of a split campus was deemed too high. The Nov. 14, 2017, Facilities Committee meeting (1) (2) included a review of Metro Deaf School at 1471 Brewster Ave., about one mile west of TCGIS. This opportunity was not pursued due to extremely limited outdoor / playground space and a parking lot that would create an extremely challenging pickup/dropoff scenario for the TCGIS community. On March 6, 2018, the facilities committee held a “Listening Session” to talk about construction plans. 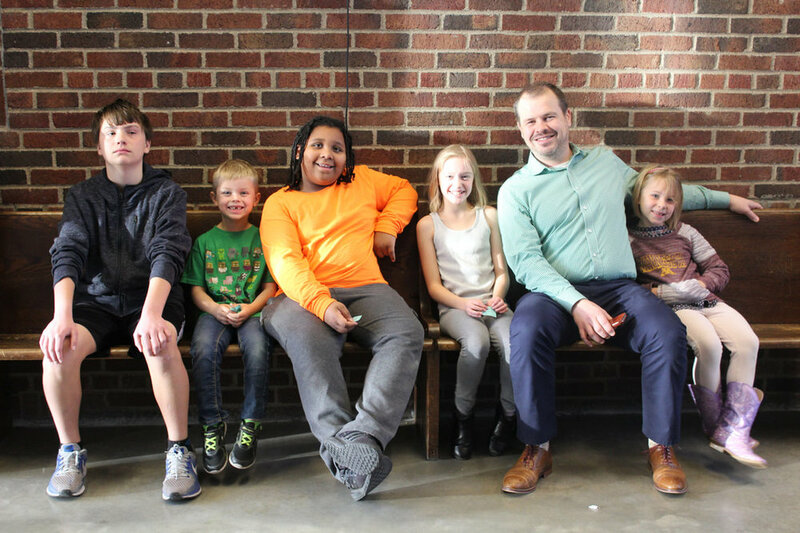 Along with about 25 parents and staff, a representative from District 10 attended the meeting, and afterwards he reported back to District 10 that the school planned to replace the Aula. This was the beginning of some neighborhood opposition to TCGIS plans. At its March 13, 2018, meeting (1) (2) (3), the facilities committee began sending out paperwork for a proposed building project that included replacing the Aula and building new construction on the school’s footprint. Contractors were interviewed, and architect Deb Rathman began conversations with key user groups of the new building. Also, plans to purchase a house adjacent to the school on Van Slyke were cancelled. At its April 10, 2018, meeting (1) (2) (3), the facilities committee began more in-depth work related to the proposed building plan of replacing the Aula and building on-site. Some of the issues under consideration included where to hold gym classes during construction and food safety during construction. The facilities committee held listening sessions on April 22 to talk about construction plans at TCGIS, and offered a historical recap of the decision. The May 8, 2018, facilities committee meeting (1) (2) (3) included discussion about a communication plan, more in-depth planning for construction, following up with neighbors, and the cons of delaying construction. At the May 23 TCGIS School Board meeting, the facilities committee chair said a new option had presented itself. It was later revealed to be Central Lutheran school at 775 Lexington Parkway North. The school was examined by RJM Construction, which prepared an estimate on what it would cost to upgrade the building for TCGIS. Original Bid from RJM, Revised bid from RJM and second bid from Rochon. There are several problems with our current building. First, there's been an unforseen lack of space. The enrollment projections for our current school building have been surpassed by a full section per grade in grades 5-8. Second, TCGIS is experiencing a need for smaller learning spaces, a need currently handled by having staff meet with students in hallways. Third, our growing student population requires two gym classes run at the same time. We meet that need by using the gym and the cafeteria for now, but that option won't be available as we continue to grow. Finally, our cafeteria is very crowded at lunchtime. Please use this Google form to submit your questions and comments. Danke! Q. What was the school’s original design? A. 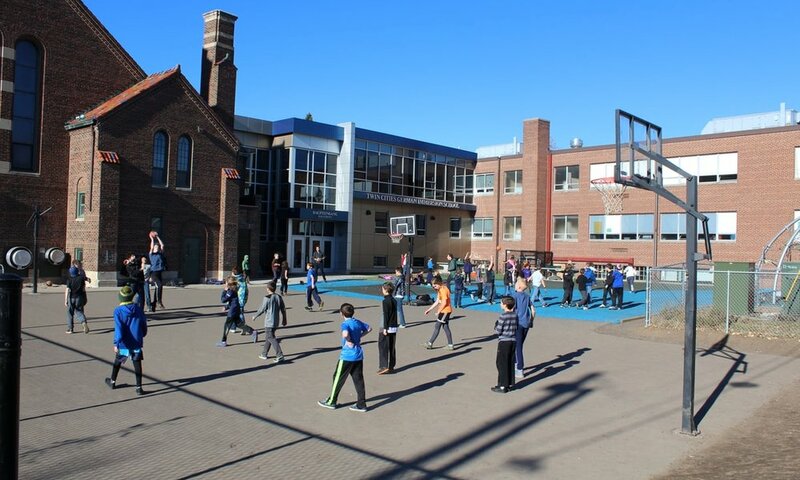 The construction project that linked the former St. Andrew’s school to the former St. Andrew’s church building created a school designed to hold three classes in each grade through 4th and two sections in grades 5 through 8. Q. Why have we had space problems? A. The school used to see smaller classes, especially among older students, but retention rates for the upper grades have increased. This means that TCGIS has to add more sections in order to keep class sizes appropriate and manageable. For example, until 2017/18, the middle school had class sizes that enabled creative solutions such as combining 7th and 8th grades for sport and drama. The class of 2018 was 34 kids = 2 x 17 classes. The classes of 2019 and 20 are 46 and 50 respectively. The class of 2021 is around 60 students, so while smaller per section (3 @ 20 each) it still needs three classrooms (instead of two) per class period to function. In addition to higher retention rates, the school has had an easier time filling open spots in grades beyond Kindergarten. 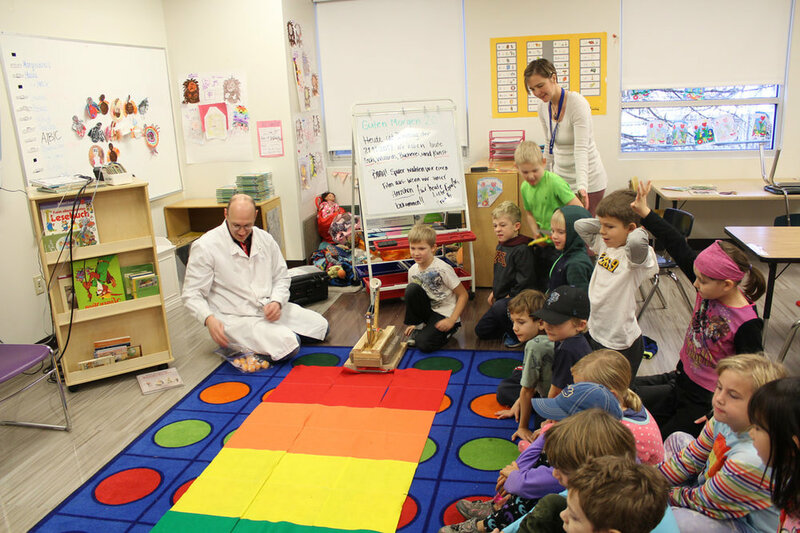 The school estimates it will need four additional classrooms to accommodate growth. Q. Could the school accommodate all students within its current footprint, without additional construction? A. Technically yes but practically no: remaining within the current facility without renovation will have severe implications for students, faculty and staff. A February 2016 report from the Facilities Committee outlined how this would occur, noting that it was possible but would cause difficulty. For example, the changes would include converting Room 100 (the conference room currently used for occupational therapy) into classrooms, and the staff lounge would need to be converted into another classroom for the 2020-2021 school year. Since the 2016 report, the Facilities Committee has concluded that the suggested changes are simply not feasible: TCGIS needs to add space for classrooms, special education, small group breakout sessions, and teacher/staff development. In particular, the need for smaller learning/breakout spaces has become more pronounced, as has the estimated impact of asking teachers and staff to do more with less. Q. What is student population, and population projections? A. The 2017-18 student population at TCGIS was 545 students. The amount of state aid the school receives is based on this number, but older students count for slightly more state aid than younger students. For state aid calculations, the number of “pupil units” at TCGIS in 2017-2018 was 560. By the 2020-2021 school year, it’s estimated that the school population will be 620, and the pupil units will be 645. This growth of the student population means more money for TCGIS in the form of state lease aid. Most of the lease aid goes to pay bills, but there’s a leftover amount each year, and as the student population grows, the amount of extra funds for TCGIS grows, too. By 2020-2021 this amount is estimated to be over $300,000. This is the money the school would use to finance more borrowing for another construction project. The Facilities Committee in 2016 estimated this would be enough for an 18,000 square foot project. Since 2016, the Facilities Committee has determined that an addition of 22,000-24,000 square feet (or 4,000-6,000 beyond the 2016 estimate) will meet TCGIS’s needs. Q. How has the school addressed its space needs? A. The school board created a panel in 2016 to examine the school’s space needs. This was the Student Growth and Access Taskforce. At the same time, the Facilities Committee was looking at the same issue, and produced a report of its own in 2016. Q. What other options has the TCGIS school board considered? A. Among the alternate locations considered by the Facilities Committee, the former Metro Deaf school was inspected but ultimately ruled out because its parking was inconvenient. The school building has one road in and out of the parking lot. Located on Energy Park Drive, the school requires all cars and buses to pull into its parking lot for drop-off and pickup. It also has very little outdoor space. The Facilities Committee also looked at the former St. Bernard’s school. It was eventually dismissed as an option because it was only available for lease and not large enough to house the entire school. The Facilities Committee is currently in negotiations with Central Lutheran for the purchase of their building. Q. What are the pros and cons of a split campus? Q. What are the estimates of costs associated with a split campus model using Central Lutheran? A. The first bid for renovation from RJM Construction is $3.4M. This would cover new floors, paint, HVAC, lights/electrical, new windows/doors and fire sprinklers. The Facilities Committee has worked with that contractor to reduce the bid, and has also solicited a bid from a second contractor. The bid is for renovation only and does not include the cost of purchasing Central Lutheran. The purchase cost remains confidential. Some potential additional costs include asbestos abatement (floor tiles containing asbestos should be removed) for $400,000; Geothermal heat pump system work for $655,860; additional wall insulation for $437,000 (possibly required by new energy code) and $191,000 for the removal of a 20-year-old underground fuel tank. The Facilities Committee asked RJM to review these estimates and determine if staging the work could lower the initial costs; the Facilities Committee is looking for a $1 million reduction from HVAC, electrical and bathroom work. TCGIS has also received a second bid for the work at CLS for approximately $2.5M. That bid does not include full asbestos abatement. While TCGIS appears to have the bonding capacity to finance the capital upgrades at CLS, it doesn't have the needed funds to maintain the Como Ave building while simultaneously completing the CLS work. The increased operating costs of a split campus will be much harder without increasing class sizes to 25/26 per classroom. The TCGIS Board and Finance Committee have worked hard to create an annual surplus in the school's operating budget; the cost of operating two campuses will erase that surplus within 2 years. A. The current estimate is that operating expenses would increase by approximately $175k annually. Q. If TCGIS proceeds with razing the Aula to make space for a new addition, could some features of the Aula be repurposed? Q. Is it possible to sell our current location? A. Yes. The Facilities Committee has contacted commercial realtors specializing in educational facilities to explore this option. Q. Why do your class sizes have to be so small in middle school? Most public schools have at least 30 per class. You should add a few kids to those upper grades to make more money. A. The TCGIS Board’s position is to keep class sizes at 24 students. Q. Does a parking variance mostly depend on neighborhood support, and how long would it take to get one? Why didn’t we need a parking variance before? A. A site plan will be reviewed by the zoning commission. They will determine what TCGIS will need for parking using a formula. For a construction project at our current site, the facility committee has been working with the city of St. Paul on a contract which would provide parking spaces at the Como Pool. We are simultaneously working on a contract for parking spaces at the Presbyterian Church on Como Avenue. Finally, there has been discussion of utilizing the south side of Jessamine for TCGIS parking. Q. A simple section called "what's next" that lays out what's happening next would be helpful. A. Thank you for the suggestion - we’ll try to make it happen! Q. The cost of heating the building is an issue. What efforts are there to reduce the carbon footprint of the school, especially in the proposed building? How are green design and sustainability being included? A. Not sure which building you are referring to. On the current TCGIS campus, we have discussed with our architect and contractor how to improve the efficiency of the classroom building (window upgrade, heating/cooling controls, etc) in addition to the improved efficiency of replacing the Aula. Q. Can we get historic preservation funds for the outside of the building and still gut the inside? Have we gotten quotes for gutting the choir loft area and building a stage? A. In order to access the type and scale of grant funding required to fully address the Aula’s needs, TCGIS would have to apply for the Aula be placed on the National Register of Historic Places, and acceptance is not guaranteed. Municipal historic designation does not offer enough (if any) access to preservation funding. TCGIS’s Board, Administration and Attorney do not believe TCGIS would be able to access enough grant funds to maintain the Aula at the level required by the National Register. Removal of the choir loft has not been explored. Q. Can we move fully to another building/location without splitting the campus at all? A. Selling our current facility while also finding/building a new facility is challenging and a risk to considering the Central Lutheran option. Q. Is it possible to outgrow the new space, if we proceed with construction? A. The school board position is to have 3 sections of K-8 with 24 kids in each class. The current design creates enough space to operate a school of that size. Q. If we stayed on the Como site, would we ever have possibilities to buy out the houses on that block (that curves around- so houses to the east nearer the park)? A. The school board does not currently have any plans to buy properties adjacent to the school. It could be a possibility in the future. Q. When will the space issues/solutions to space issues be finally decided? What date will the community know what to expect? A. The school board called a July board meeting to discuss the options vetted by the facility and finance committees. A motion and vote could happen at this meeting, which is scheduled for 6:30pm on Monday July 30. Q. Are there any other potentially-viable options to purchase besides CLS? A. The facility committee has looked at many properties in the search to solve TCGIS’ space need. Currently the facility committee isn’t considering other properties. Q. It is difficult to financially compare apples to apples w/o the purchase price of the new facility/temp split campus option. A. School board policy requires real estate property transactions remain confidential while in negotiations. What has been shared is operating a split campus increases operating expenses by $175,000 annually, meaning TCGIS would have to consider raising class sizes to increase operating revenue. Also, moving forward with purchasing an additional property without a buyer for TCGIS’ current facility means we have to plan for maintenance and rehab expenses at both sites, which isn’t viable long term. Q. Any way to preserve some of the Aula structure for historical purposes? Q. Can another top floor be added to the existing building that could potentially function as a gym? A. No. The site has a zoning height restriction of 30’ and is cost prohibitive. Q. 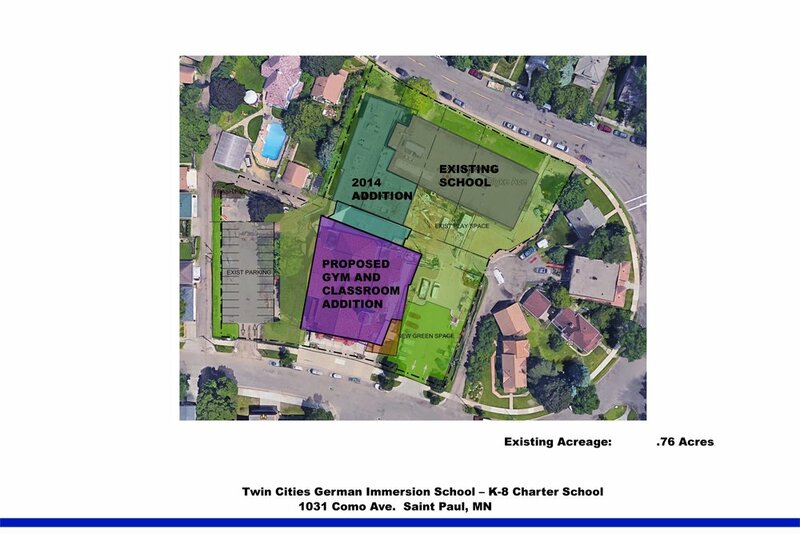 If TCGIS will move to Central Lutheran School building, what will happen to the Aula then? TCGIS is responsible for the building until it sells and did anybody quantify the risk of not selling or the loss of a discounted price due to the Aula? A. Selling our current facility while also finding/building a new facility is challenging and a risk to considering the Central Lutheran option. Please view the budget document shared on the building project website showing expenses related to projected building maintenance and its impact on the building fund budget. Q. I hope there is a plan to help the SpEd Dept find spaces for services in the meantime. We can not wait two years to teach our kids to read. Can we rent space from the church across the street? A. TCGIS has consolidated administrative staff to free up office space. ADSIS support and RTI pull outs will have additional space ready for the upcoming school year. Q. Why was the previous architect automatically chosen? A. Rivera Architects was not “automatically chosen” - their firm was a good partner on the first project and has been a valuable resource to TCGIS while we evaluated the school’s space needs. 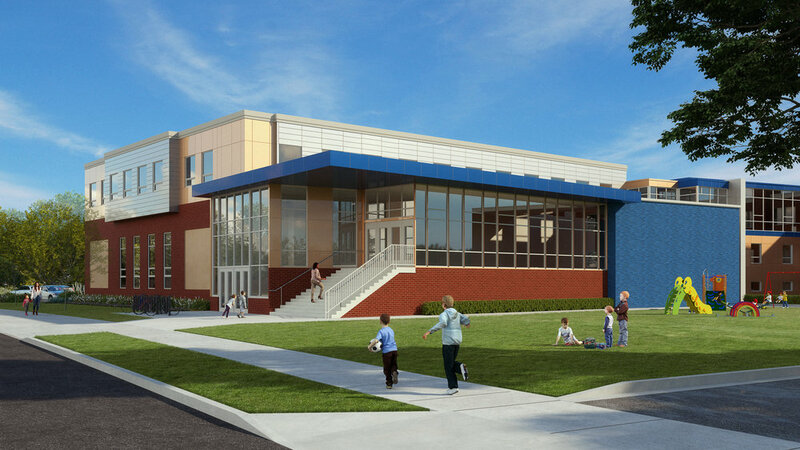 Rivera Architects also has considerable experience working with charter schools. The school board discussed engaging with other architects and decided to work with Rivera again. Q. Who determined asbestos-containing tiles [at Central Lutheran School] need to be removed and why? undisturbed asbestos is not a hazard. is there a law requiring mitigation regardless of risks and costs? A. The problem with leaving asbestos in place even in a non-friable condition is every time TCGIS might need to do work which could disturb an area containing asbestos, TCGIS would have to take additional precautions and mitigation efforts. These are significantly more costly and come with the risk of making the asbestos containing products friable. Q. What's the present status on the Como site becoming an official "historic" site? A. In St. Paul, anyone can nominate a building for municipal historic designation. The process takes nearly 1 year from the date of application and includes three public hearings by the Historic Preservation Commission, the Planning Commission and the City Council. There are no restrictions on a property until the Mayor designates it as historic. TCGIS has no plans to pursue designation on the National Register.